For much of the 20th Century the WA Wheatbelt farming community was indeed riding on the Sheep’s back but when market drivers made livestock less profitable and demand for grain soared, many farmers sold up their flocks. Now meat and wool is making a comeback. The town pool in Northam was a hive of activity over the last couple of weeks as the Noongar Budjar Rangers assisted the Shire of Northam to plant the river banks with native species. One of Perth’s top chefs has travelled to Northam to help reinforce the demand for bush tucker. People living in the Wheatbelt now have a website they can use to help identify their local flora and fauna. Rabbit populations in the Wheatbelt and across the south-west of WA could be reduced by around 40% in the coming weeks, as the calicivirus (Korean variant – RHDV1 K5) is released throughout the region to overcome growing rabbit numbers. Work has finally begun on the rehabilitation of two iconic lakes in the Wheatbelt and Great Southern regions of Western Australia. Focusing on increasing soil fungi and microbes can help drastically improve the uptake of key nutrients including phosphate and nitrogen. More than 50 people have taken part in a night-time bat stalk through the Quairading Reserve. Pioneering a system to turn around unproductive, acidic soils has won a Burracoppin farmer the title of the 2018 Wheatbelt Soil Champion. The Australian Government has generated a 50 per cent return on investment from landowners in the Wheatbelt when it comes to funding land care projects. The search is on to find the State’s newest Soil Health Champions. This year’s wet summer has provided a nitrogen windfall for many broad acre farmers in the Wheatbelt. Yield gains of up to 45 per cent in broadacre crops have been the key driver behind a trial using very deep ripping for Southern Brook farmer Ty Fulwood. A grant of $150,000 is set to upgrade ageing software for the region’s peak natural resource management group. The Northam Cemetery has been given a facelift, with help from the region’s Noongar Boodja rangers. The proponent of a planned $160 million solar farm near Cunderdin is encouraging people living in the Wheatbelt to explore all types of renewable energy. The town of Wundowie's main playground has been officially re-opened, after the local Noongar Boodja rangers spread hundreds of tonnes of white river sand, making it safe. More than 50 people have taken part in a night-time bat stalk through the Goomalling Golf Course. Red Card for Rabbits and Foxes brings together community members to help stop feral animals damaging the environment, and this year Regional Men's Health will benefit from the program too. Wheatbelt farmer Stephen Smith couldn’t have chosen a better year to trial a summer cropping program on his Cunderdin farm. More than 50 people have met at the unveiling of a plaque to remember one of Brookton's most important indigenous sites. Bruce Rock farmer Stephen Dolton has had improved yields in his canola crop where lime has been incorporated using a deep ripper. A drop in crop yields and the extinction of the Western Mouse by 2070 are just two of the predicted impacts of climate change in the Wheatbelt. Using locally sourced lime to fight soil acidity in the Wheatbelt was one of seven projects to share in $85,500 in new funding for sustainable agriculture. Landowners and carbon companies wanting to grow trees for the carbon market now have a tool to help guide them on where best to plant. The changing soil types on Robert Dempster’s Goomalling farm make fertiliser and chemical application, deep ripping and mould board ploughing nothing short of an ongoing challenge. Lone salmon gums standing in a paddock, rocky granite outcrops and locals living in the Wheatbelt will feature in the region’s latest photography competition. Microbats consume more than 1000 mosquitos a night, eat more insects than a bird and are the world’s ony flying mammal. Wyalkatchem Men’s Shed and the local school have teamed up in a bid to help native wildlife. Ever wanted to discover a new species or unearth a rare plant? Sheds across the Wheatbelt are rumbling to the sounds of woodwork and sweat as specialised nest boxes are being prepared for threatened species to shelter in. Wheatbelt landholders should think twice before clearing vegetation on their property, despite having State government approval. Landholders needed to step up their efforts to protect native bushland following the listing of WA’s Wheatbelt woodlands as critically endangered under the Federal EPBC Act. 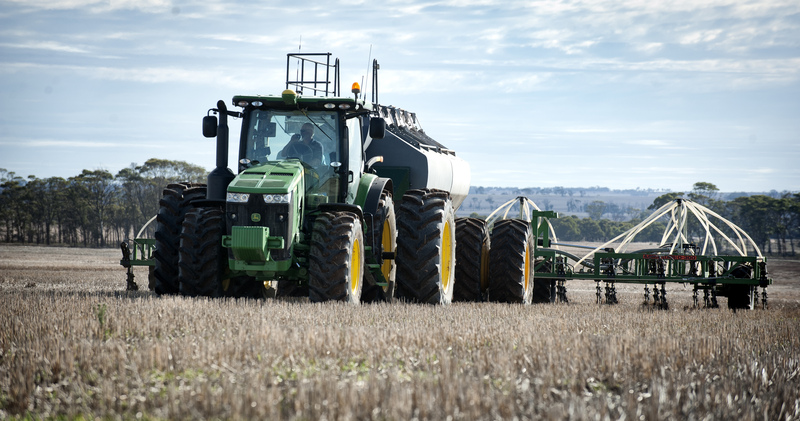 Farmers in the eastern Wheatbelt are hoping trials investigating the application of ultra-fine lime on their acidic soils will provide them with a bigger bang for their buck. The Australian Government welcomes today’s Wheatbelt Natural Resource Management’s announcement that 22 local groups and landholders will share in $185,300 in grants under the National Landcare Programme. One of the Wheatbelt’s newest farming groups has secured funding to try and improve the way soil acidity is tackled throughout the Wheatbelt. The Australian Government welcomes today’s Wheatbelt Natural Resource Management’s announcement of their third round Bushcare Grants to 32 more landholders who will share in $278,462 in grants under the National Landcare Programme. Woylies, skinks and bush wallabies were just a few of the hundreds of native animals, invertebrates and flora identified in the State’s latest Bioblitz. Brown and green manuring of leguminous crops is a great way to control weeds, increase soil cover, improve soil fertility, conserve soil moisture and increase soil fertility. Adding legume mulch can also increase the levels of carbon within the soil. A group of scientists working in the Wheatbelt have turned back the clock in the search for a low input, summer food source for sheep. Last week’s rainfall couldn’t have come soon enough for Kellerberrin farmer Murray Clements. The first projects under the Australian Government’s National Landcare Programme have begun in the Wheatbelt. Landholders are being warned they need to register any trees they’ve planted in the past seven years, if they want to take part in trading the sequestered carbon from them in the future. The Green Army is for the first time marching into the Wheatbelt to help fight invasive weeds along the Avon River. A survey of Landcare and farming groups in the Wheatbelt has revealed at least three quarters of members thought they were making a difference to the environment. The lack of rainfall and salinity appear to be the biggest environmental concerns for people living in the Wheatbelt. Koorda landholders Matthew and Lynne Cooke have spent part of their summer fencing fragile vegetation growing on part of the Cowcowing lake system. The WA Governor has spent time at Burlong park walking along the Avon River as part of her first official visit to the Wheatbelt. Poultry farmers have spent years trying to find a market for their chicken manure, and a solution may now be in sight with help from the forestry and broad acre cropping industries. Hundreds of farmers from nearly all of WA’s agricultural regions have become part of a new website promoting sustainable farming research work undertaken on their farms. Sandalwood, soap bush, eucalyptus and wattle are just some of the native species collected by a former Brookton lady, making a name for her self specialising in bush medicine. The full impact of land clearing was yet to be felt, according to a new plan that maps out the environmental situation in the WA Wheatbelt. The fight to save one of the Wheatbelt's most iconic native species has been given a boost. Wheatbelt landholders are being reassured the management of their property won't be comprised if they accepted government funding for landcare projects. Leigh Whisson has worn many hats over the past two decades, many of them focusing on the health of native wildlife and fauna in the WA Wheatbelt. An interactive website show casing the land management practices Aboriginal people have carried out in the Wheatbelt will be officially launched in Northam on Thursday, March 20 2014. The Kulin Wildflower Group and Herbarium is encouraging other groups in the Wheatbelt to apply for a grant to help them in their daily operations. The valuable lessons of 24 Wheatbelt farming families working to improve the sustainability of their farms have now been put on paper. One of Beverley’s former iconic sites is slowly being restored to its former glory, but it’s not the local bank or town hall. Farmers in the Wheatbelt could finally be making a return on their investment from planting trees. Greg Warburton has lost count of the number of trees he’s planted and weeds he’s killed in order to protect native vegetation. A simple but clever way to plant trees during the frustratingly dry winters has helped in the survival of thousands of seedlings in the Wheatbelt. Planting trees alone won’t be enough to bring back the native fauna in the Wheatbelt. Victorian-born Andrew Shanks first visited WA in the mid-1990’s, and after travelling through country areas, fell in love with the place and decided to make the move permanent. Sheep farmers could soon have access to newer, tastier saltbush varieties, to help improve returns on their less productive, saline land. Bird watching enthusiasts and bush walkers now have better access to one of the most beautiful vistas along the Avon River. More funding has been released to help Wheatbelt farmers manage trouble spots on their properties including areas prone to wind erosion and water logging. Two wildflower groups, a river conservation society and a native sandalwood enterprise have been given a hand to help with the daily running of their operations. Seven towns in the Wheatbelt will share in $2 million to help capture precious storm water run off. Residents along the Avon River are being asked to join in a war on weeds choking their local waterways. South Dowerin farmer Gavin Hagboom has spent the best part of his farming career searching for ways to improve his soil health. About 200 farmers, scientists and industry representatives have met in York to learn how to tackle declining soil health in the Wheatbelt. Farmers wanting to earn a return on one of the Wheatbelt’s most popular re-vegetation options are being told not to give up hope. Grants to improve farm sustainability in the Wheatbelt Community landcare groups are being encouraged to access funding to help protect the Wheatbelt’s natural resources, including farmland. The former Australian Governor General and the country’s first Advocate for Soil Health will open the Talkin’ Soil Health conference in York later this month. The newly formed Friends of Mortlock and Mortlock South Group was presented today with two cheques with a combined value of $50,000 from the State Government. A campaign to eradicate weeds that are severely impacting on the bio-diversity of the Avon River has stepped up a notch. The scenery on Gen Whisson’s journey to work each day is a vastly different one to that of two years ago. An iconic Wheatbelt wallaby has been given extra protection after the State government announced $350,000 to target its predators. The slow creep of non-wetting soils across Damien Leeson’s Wheatbelt farm has prompted a major trial into how to address the problem. Scientists are now investigating if a new species of scorpion has been discovered after a community-based survey held in the central Wheatbelt. Wheatbelt farmers now have an opportunity to learn how the Carbon Farming Initiative will impact on them. A patch of bush near the central Wheatbelt town of Cunderdin is the latest area of land in WA being protected under a conservation covenant. Eight innovative farmers have been selected as Wheatbelt Champions in a push to highlight the importance of soil health in the region. The hot, dusty summer of 2010 followed one of the driest winters on record for WA’s broadacre farming community. Does the way we farm affect the amount of organic carbon that can be stored in our soils? Wheatbelt wildlife enthusiasts will now have access to motion trigger cameras to help them spy on native fauna in their own backyards. More towns in the Wheatbelt will harvest storm water run off after a $2 million funding boost from the State government. A team of landholders from north Kellerberrin has claimed victory in a local feral pest hunt. Cam and Meg Gethin now more than ever value the few patches of bush land left on their Hines Hill farm. A project designed to teach children in Northam about their natural surrounds has caught the attention of WA’s science teachers. More than half a million dollars will now be spent on protecting native bush in the Wheatbelt. Some of the Wheatbelt’s environmental managers have now been armed with the latest computer technology to help them in the field. A new species of spider found in the Wheatbelt has been named by National Geographic’s editor as one of the ten weirdest life-forms of 2011. Meckering farmer Colin Pearse has been given a significant boost in the fight against salinity on his farm. Work is underway to help preserve one of the few known families of western spiny-tailed skinks living in the WA Wheatbelt. Quairading farmers Bill and Rich Walker believe claying their light, sandy soils on their mixed cropping farm has been well worth the investment. Like most other Wheatbelt farmers, Cunderdin’s Chris Syme has embraced no-tillage cropping. Volunteers working hard to rejuvenate a local waterway west of York, have been recognised for their efforts in the WA Landcare Awards. The chance discovery of an unusual looking spider in the backyard of a Grass Valley home has lead to the identification of a new species of arachnid. Staff normally more at home behind a computer have left the confines of their offices to help rehabilitate a stretch of the Avon River between York and Beverley. The search is now on for a new chief executive officer to head up the Wheatbelt’s leading natural resource management group. The temptation to continue cropping an unprofitable part of his Bencubbin farm was one of the motivating factors behind Lynton Beagley’s decision to plant Sandalwood. Scientists monitoring the health of the Avon River have unexpectedly found a number of native fish species. Over the past year landholders have helped protect and revegetate more than 4 million hectares of land in Western Australia. New research has shown sheep make up the biggest part of a foxes’ diet, but they also have a liking for mulberries and figs. Nearly $100,000 will be spent over the next couple of weeks improving rivers, creeks, bush land, communities and schools in the WA Wheatbelt. A survey of women living in the WA Wheatbelt has revealed some of their greatest concerns when it comes to the environment. Natural resource management group Wheatbelt NRM has taken out top honours at this year's WA Regional Achievement and Community Awards. A group of Wheatbelt farmers who received funding to film a DVD on the benefits of tree cropping are encouraging others to apply for a similar grant. An echidna wanders in front of a hidden camera and stops to drink from a puddle. The scene is nothing dramatic, but what happens next provides the first such footage taken in the WA Wheatbelt. Five women from the WA Wheatbelt have returned home after spending a week investigating how Victorian families survived drought. The majority of WA Wheatbelt farmers lost equity last year. With this season shaping up to be another tough one, current farming practices are coming under the spotlight. About 60 farmers turned out to a workshop in Trayning looking for answers on how to improve soil fertility. The secret life of some of the Wheatbelt's rarest and interesting native animals will be on display at this year's Dowerin Field Days. A Wheatbelt farming couple has made a discovery of at least 10 rare and endangered plants on their property south west of Dowerin. A new program is hoping to encourage better recognition of rural women and the influence they have on farms. The Wheatbelt was just one of the winners after the State government announced it would allocate $4.9 million of new money for natural resource management. A project designed to educate school children in Narembeen about the local native flora now has a more permanent place in the curriculum. A leading Australian agroforestry expert is warning of the risks the large scale planting of trees to offset carbon emissions could bring in the WA Wheatbelt. A survey of small fauna near the Wheatbelt town of York has led to the discovery of several undescribed species of insects and spiders. Broadacre farmer Trevor Syme is one of 12 Wheatbelt landholders helping to tackle wind and water erosion by improving the soil on his Bolgart farm. Natural resource management group Wheatbelt NRM has taken out a gong at the 2009 WA Landcare Australia awards. A project aimed at saving drinking water in the WA Wheatbelt could also help sustain the local sports field, the lifeblood of many country towns. A project to help save precious drinking water has come to fruition at one of WA’s leading agricultural colleges. Native bushland in the WA Wheatbelt will be better protected thanks to a $660,000 project funded by the Commonwealth Government. A program designed to enrich the lives of older men has undertaken a tree planting program with a difference. People living in the WA Wheatbelt are being asked to help shape the future of natural resource management in their backyard. Enthusiastic community members got their hands dirty this week at Burlong Pool for a tree planting day coordinated by the Avon Catchment Council (ACC). Staff from the Avon Catchment Council this week got their hands dirty and helped with the planting of thousands of trees in the Beverley district. A project aimed at identifying wetlands in the WA wheatbelt has revealed more than 20,000 scattered throughout the Avon River basin. Scientists say they’ve found new populations of threatened trapdoor spiders in the Avon River Basin. Agriculture is an integral part of the Avon River Basin so providing ways to maintain and improve natural resources without impacting on the profitability of farm enterprises is a priority of the Avon Catchment Council (ACC). The Avon Catchment Council (ACC) is encouraging residents of the Avon River to comment on the recently released Swan Canning Water Quality Improvement Plan. More than $3.9 million of new funds will be spent on improving the environment and livelihoods of people living within the Avon River basin. WA farmers have begun a massive assault on foxes, which cause an estimated $200 million nation-wide in damage each year. Providing farmers with ways to maintain and improve the natural resources which underpin agricultural production is a priority of the Avon Catchment Council (ACC). Community support is growing for next month’s “Red Card for the Red Fox” baiting program. When Merredin farming family Pep and Jules Alvaro were first approached to put their 53 hectare bush block under a covenant they were reluctant. The Royal Flying Doctor Service will again benefit from a program aimed at controlling feral animals. Wheatbelt farmers Kath and John Cousins want to leave a legacy for their children that isn’t a landscape of salt. Rare and vulnerable native plants and animals will be given a better chance of survival thanks to a new Avon Catchment Council grants program. Time is running out for farmers in the Avon River Basin to apply for free saltbush and tree seedlings. One of the most important biodiversity ‘hotspots’ in the WA Wheatbelt is being targeted in an effort to conserve it. A landholder from Tammin and a Professor from Curtin University have been appointed to the board of the Avon Catchment Council. The Avon Catchment Council and Avon Natural Diversity Alliance combined forces to create an interactive and informative display at Dowerin Field Days, providing information and entertainment to all who entered. The Avon Catchment Council (ACC) is providing support and information to farmers and landholders in the WA Wheatbelt to enable them to better understand water management, rainfall trends and climate change issues that impact on agriculture. The Narembeen community are another step closer to resolving issues associated with disposal and management of deep drainage water after more information was provided by the Avon Catchment Council at a recent Stakeholder Reference Group (SRG) meeting in Bruce Rock. Limited water resources are a problem faced by many farmers in the WA wheatbelt, especially as the demands for water for stock, spraying and domestic use increase. A new approach to the preservation of native bush was launched near the eastern Wheatbelt community of Westonia today. An innovative website has just been launched featuring inspiring stories of thousands of volunteers across Australia working to manage land sustainably and conserve the environment. As the community-based natural resource management organisation for the Avon River Basin, the Avon Catchment Council (ACC) is helping provide direction to the regional community and governments on dryland salinity management options through deep drainage. Bridal Creeper, regarded as one of the 20 worst weeds in Australia, is the target of an Avon Catchment Council (ACC) project that commenced recently working with Avon River Basin communities to map Bridal Creeper infestations and then together deciding the best method to control the weed locally and regionally. A new round of the Avon Regional Salinity Tender opened this week, providing farmes and landholders with the opportunity to tender for funds to implement management practices to address dryland salinity. The Avon Catchment Council (ACC) today announced twelve landscapes (Ecoscapes) in the WA wheatbelt identified as priority areas to conserve the biodiversity of the Avon River Basin. Today is the celebration of a unique partnership between the Aboriginal community and the Avon Catchment Council, reflecting the common goal of seeing our land returned to its former beauty. Do you have a great idea for a natural resource management project? Could you use up to $50,000 for environmental works in your area? Vital new soil research information will now be more easily available to agricultural communities of the Wheatbelt and south coast, thanks to the employment of a Soil Health Extension Officer. Landholders and interested community members in the Dale River catchment and surrounding shires are invited to participate in a free Rivercare workshop on Friday 25 August 2006. Development of a state-wide soil quality project to assess and define the range of soil quality characteristics associated with ‘good’ and ‘poor‘ production areas. The Avon Catchment Council (ACC) is calling for nominations for Community Board Members. The Avon Catchment Council aims to improve water quality in the Avon River and the condition of vegetation beside the river and its tributaries. All students in the Avon Region are invited to enter the Ribbons of Blue Environmental Art Competition. Community and school groups are invited to participate in a Ribbons of Blue/Waterwatch WA’s Saltwatch event for 2006. NRM officers involved in rivercare across the State recently had the opportunity to hear the latest research from Land and Water Australia’s National Riparian Lands Program. Ribbons of Blue is back in the Avon for 2006. The Top 10 environmental pests in the Avon region, including Cape Tulip, Feral Cats, and European Rabbits, have been determined, as a result of nominations from the Avon community. The first Avon Catchment Council Investment Plan Projects are hitting the ground in the Avon Region. The Avon Catchment Council’s Priority Environmental Pests project has just released a Pest Nomination Form enabling community members, landholders and those living in the community to nominate the plant and animal pests that are impacting on priority environmental assets. The Avon Catchment Council (ACC) has awarded 14 contracts to delivery organisations through a comprehensive Expression of Interest and Tendering process. Avon Catchment Council Indigenous NRM Facilitators Rod Garlett and Michelle Winmar, recently conducted a Noongar Cross Cultural Awareness Workshop. The Avon Natural Resource Management (NRM) Strategy developed to manage land, water and biodiversity resources for the Avon River Basin has received Australian and State Government approval. Agriculture Minister Kim Chance today congratulated Cathy Lyons for winning the Department of Agriculture's Landcare Professional Award for 2005. Two WA malleefowl applications have been funded under the round 8 TSN Community Grants Program. The Avon Catchment Council (ACC) Strategy and Investment Plan outlines a new era of natural resource management for the Avon Region. This includes the addition of new staff members to assist in project delivery. Wheatbelt Aboriginal communities in the Avon River Basin will have greater opportunities for input and involvement in NRM. Nearly 2000 hectares of trees are proposed to be planted in the Avon Region by the end of 2008 under a joint WA Government/Commonwealth program to combat salinity. Tony McRae MLA, Parliamentary Secretary to the Minister for Agriculture and Forestry; the Midwest and Wheatbelt, visited the Avon Catchment Council office in Northam on 27 July 2005. The Australian Government is offering up to $50 000 in Community Water Grants to provide support for community activities that promote wise water use. The Avon Catchment Council recently employed a state Malleefowl Network Facilitator to support the WA Malleefowl Network and encourage the delivery of malleefowl conservation initiatives.